It’s March Plaidness at the Arts Center, with two chances to get your plaid on in honor of the looming tournament season upon us (and warm weather perhaps?). Once, at the Arts Center’s Spring Gala and again during the exciting production of Forever Plaid. First, the Arts Center will be draped in plaid, when its Spring Gala – Mad about Plaid – happens Saturday, March 28, beginning at 6:30. 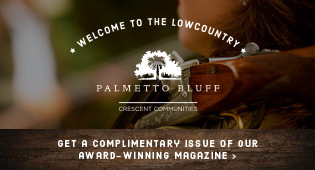 You are cordially invited to attend the festivities, which will include delicious heavy hors d’oeuvres and libations at the Cocktail Party sponsored by the Westin Hilton Head Resort and Spa. After that, partygoers adjourn to the theater for an exciting live auction with a few fun surprises in store! At the conclusion of the live auction is the Gala Premiere of the musical Forever Plaid! This will be Opening Night of the eight-show run, and in all our plaid, we will kick off the tournament season in style! Make your plans now for the Mad about Plaid Gala, Saturday, March 28, by calling Lynda Halpern, Patron Event Manager, at (843) 686-3945, x 307 or email her at lhalpern@artshhi.com. On a stormy night in the 1960s, four eager-to-be-famous singers known as “The Plaids” – Sparky, Jinx, Frankie and Smudge – are killed in a car crash on the way to their first big gig. In the spring of 2015, they get one chance to return from the afterlife and bop-shoo-bop their way through classic hits that pay an affectionate homage to the close-harmony male singing groups of the 1950s, and fulfill their dreams by performing the show that never was. 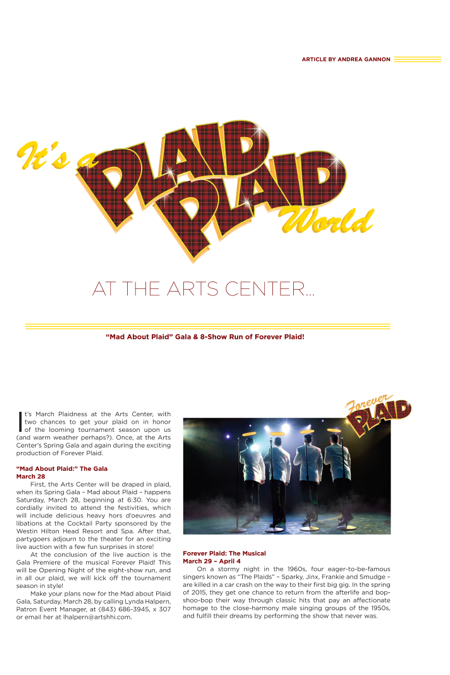 Written by Stuart Ross, with arrangements by James Raitt, Forever Plaid will be directed and choreographed by Mark Martino, new to the Arts Center, but not new to the show. Mark said, “the show is very close to my heart as I was a part of the show when it was originally created, and have had a long and happy history with “Plaidland” ever since! “In fact, I can’t wait to share the joy that is Forever Plaid with the Hilton Head audiences. The story of these four lovable characters as they get a once in a lifetime chance to do the show of their dreams is filled with lots of laughs, a couple of tears, and some of the most beautiful songs from the golden era of male quartets (the late 1950’s and early 1960’s) ever written. When the Plaids launch into the soaring harmonies of “Three coins in the fountain,” “No not much”, “Shangri-la” and “Love is a Many Splendored thing” the Arts Center audiences will find themselves transported to those days when The Four Freshman, The Platters, The Four Lads, Bobby Darin, Tennessee Ernie Ford, and Perry Como ruled the radio with their smooth vocals and thrilling harmonies.